It arises from the front of the abdominal aorta directly under the aortic opening of the diaphragm at the level of the intervertebral disc between T12 and LI vertebrae. It is a short, broad vessel (1.25 cm long). It passes towards the left to connect with the cardiac end of the stomach and upward also where it turns forward in order to run downward along the lesser curvature of the stomach. It produces esophageal branches at the cardiac end of the stomach and various gastric branches around the lesser curvature of the stomach. Gastroduodenal artery emerges at the upper border of the first of the duodenum. It runs downward behind the duodenum and terminates at its lower boundary by separating into right gastroepiploic and superior pancreatic duodenal arteries. Right gastric artery arises at just distal to the origin of gastroduodenal artery. It turns to the left and runs upward with the lesser curvature of the stomach. 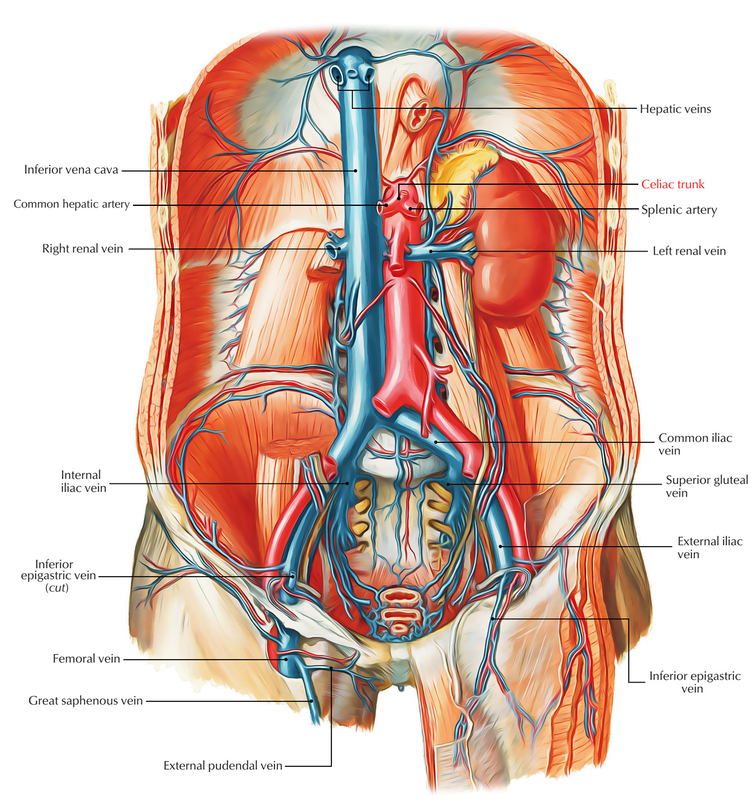 Hepatic artery proper is the extension of the common hepatic artery. It gives rise to right and left hepatic arteries at the porta hepatis. 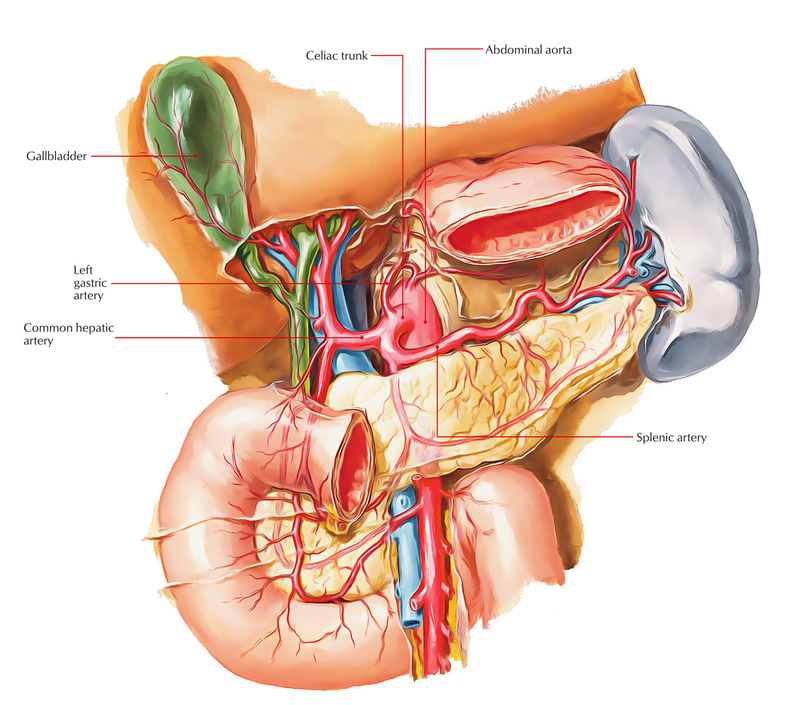 The right hepatic artery gives origin to cystic artery to supply the gallbladder. The right and left hepatic arteries supply the right and left physiological lobes of the liver, specifically. Pancreatic branches: They are numerous and supply entire pancreas except the head. The named pancreatic branches are large and constant, viz., (i) dorsal pancreatic artery which generally arises from the splenic artery near its origin, (ii) great pancreatic artery (arteria pancreatica magna) which enters the body of pancreas and runs along the main pancreatic duct, and (iii) caudal pancreatic arteries that supply the tail. The pancreatic sections anastomose freely with each other and one of these is termed inferior pancreatic artery. Short gastric arteries (3-7 in number): They arise via the terminal part of the splenic artery and supply the fundus of the stomach. Left gastroepiploic artery: It arises from the terminal part of the splenic artery near the hilum of spleen and runs along the greater curvature of the stomach, and ends by anastomosing with the right gastroepiploic artery.